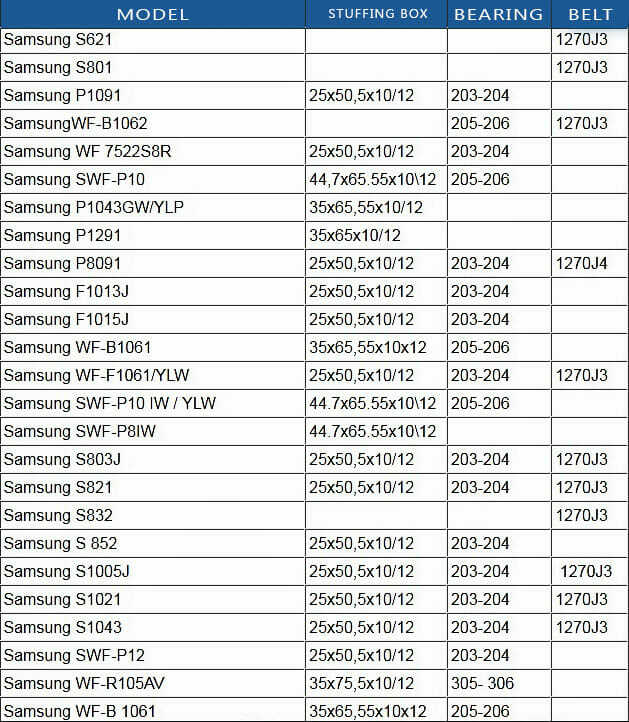 Even reliable Samsung washers require maintenance, especially after 5-7 years of operation. The replacement of a hose, a rubber gasket or a drive belt is easy to perform. 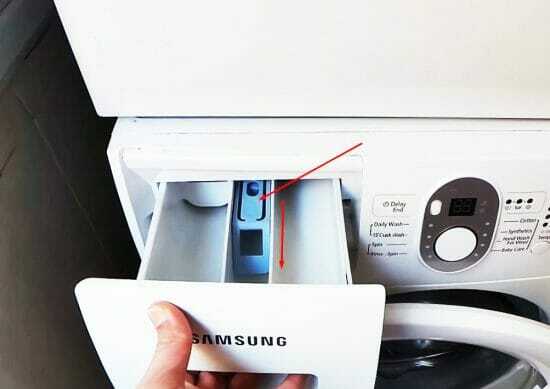 The replacement of the drum bearings of the Samsung washing machine may require effort, time, and money. If the bearing is broken, the only way to troubleshoot the problem is to replace it. The part is usually beyond repair. Prepare a convenient place for you to disassemble the machine. Perhaps, your bathroom has little space. So, if possible, move the appliance to a workshop or a garage. Next you need to remove the inconvenient details to take off the tub. You need to disassemble the washer part by part for you not to lose its parts and fasteners. That’s why, make sure to sort and keep in order everything you remove. Remove the top panel by unscrewing the two fasteners located at the corners at the back panel. Then grab the panel with both hands, swing the panel outward and then up. 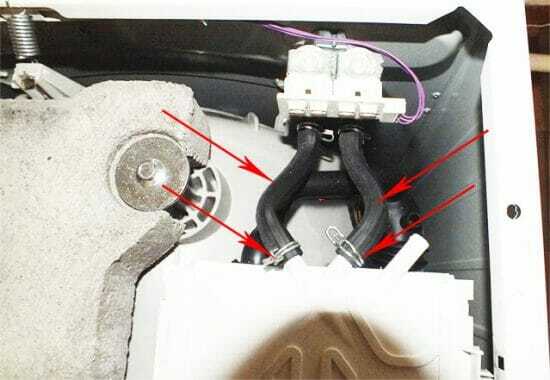 After removing the detergent drawer, unscrew its fill hoses and the pipe connecting the drawer and the tub. Loosen the clamps using a pair of pliers. Then you can see the counterweight at the top of the machine. It looks like a big brick or a stone. Choose the right cap to unscrew the fasteners. Then you need to take off the rubber gasket. Unscrew the two bolts securing the lock assembly. 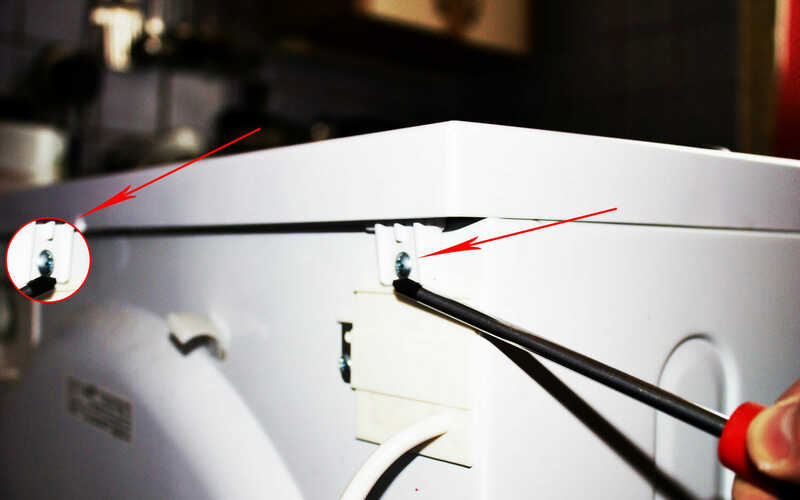 Remove the switch in order not to damage the wiring while removing the rubber seal. Use a thin screwdriver to pry off the retaining ring. Find the spring moving the screwdriver under the ring. Release it. Loosen the screw and remove the retaining band. With your fingers under the rubber gasket, swing it outward. You don’t need to remove the entire gasket – just enough to remove the front panel. After that, place the machine on its side to access the bottom of the washer. Remove the bottom by unscrewing the 4 bolts securing it. Locate the motor and the drain pump. Remove all their wiring. If possible, record the video of the disassembly process for you to reinstall all the wiring harness in the right order. If it is inconvenient for you, label all the wires using a marker. Warning! The contacts connecting the wires to the sensors are very weak, so try not to damage them. If you find some burnt contacts or wires, replace them immediately. 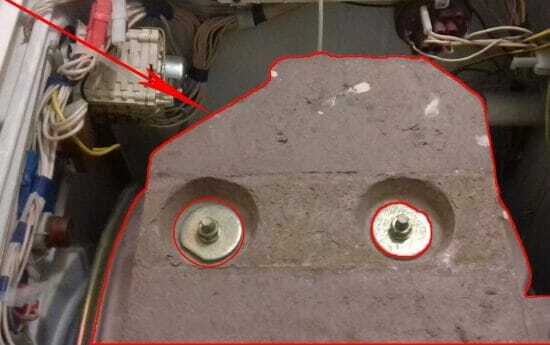 Now you need to remove the armatures, otherwise you can not proceed with the bearing replacement on the Samsung washing machine. The ends of the armatures are secured to the tub on one side and the housing of the machine on the other side. You don’t need to remove anything else at the bottom, except for the motor. The pump won’t obstruct your work. You only need to remove its hoses. Let the washer be placed horizontally. It will facilitate your work while removing the inlet valve along with its hoses and sensors. Remove the wiring connected to the valve and then unscrew the mounting bolts holding it. Remove the valve and put it aside. At last, remove the 4 springs, on which the tub hangs. You only need to remove the side and the front cover to get into the tub. The control panel rests on the 5 bolts. You can easily remove the panel by unscrewing the bolts. Our warning is to be careful and not to damage the control panel wiring. Some ten fasteners hold the front panel in place. Find and unscrew them all. Remove the cover and put it aside. By the way, you can see another counterweight under the front panel – smaller than the main one. Take a socket wrench and unscrew the weight. Now nothing prevents you from getting out the tub. Take out the motor and the tub. It is important not to damage the wiring and other sensitive components as it will elongate the repair work. Remove the drive belt from the pulley. Loosen the pulley with a hex key. If the pulley is tight, apply a little bit of WD-40 for you not to break the bolt. Since you have already removed the armature, you need to remove only clips and staples. Your tools will help you. This is an easy job with no special nuances and challenges. The top part of the tub with the hatch opening at the center. The bottom part of the tub with the heater attached. The drum and the shaft. If you wish, you can check the inside part of the tub for damage and the heater for dirt, limescale, short-circuit and housing breakage. Use a tester for the last two checks. If you have found problems with the heater, you can remove limescale deposits or replace the part. Find 2 various size bearings in the tub bush. You need to tap it from the outside towards the tub with a mallet and a pin to free the bearing. You can get the small bearing by tapping it from the inside of the tub. Get a pin, put it to the edge of the bearing and lightly tap on it with a hammer. Put the pin to the other edge and lightly tap on it with a hammer again. Proceed with tapping on the pin along the bearing edge until you loosen the bearing. Attention! Always choose several points for tapping while releasing the part – at least 3 points. Otherwise the bearing will come out crooked or may get stuck in the bush. As a result, you will waste some time solving the problem. By the way, you can remove the bearings at any vehicle workshop. The workers have special pullers there. So, if possible, contact the professionals. They usually do this kind of work for a nominal fee. tap it a few times with a mallet until the part fits its housing. break the bush while tapping out the bearings (in this case you need to change the drum).